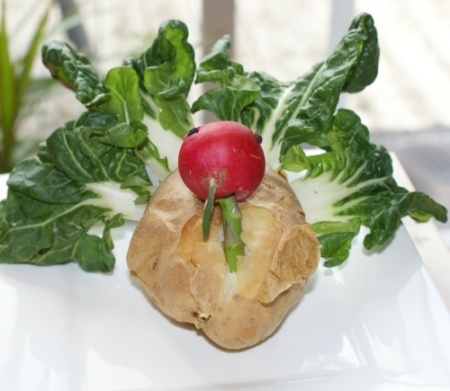 Thanksgiving made me think about fun and inexpensive ways to decorate the table and here are some of the results, a potato turkey, an apple turkey and a nutty turkey. These food animals can be used to decorate the table at Christmas, Thanksgiving or any other time of year that you need a bit of a laugh. I thoroughly enjoyed making them and I hope you enjoy the post. 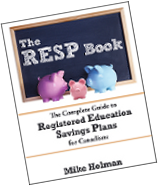 This is a great activity to do with kids of any age. This could be a great Thanksgiving or Christmas dish for the vegetarian at your dinner table. 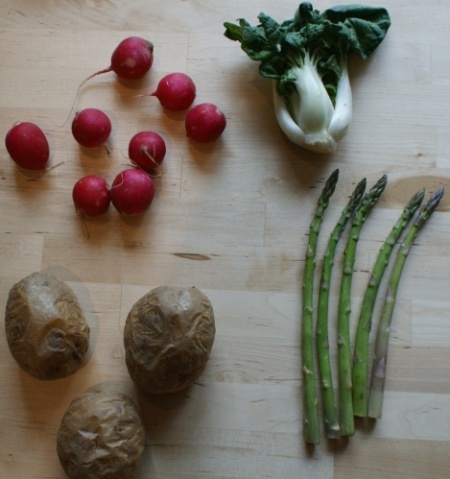 Healthy potato and yummy radish make a pretty good little snack. Or you can just make gobble, gobble noises while you play with the potato turkey. You can substitute any of these if your fridge is missing something. Any leafy vegetable can be used in place of bok choy, a sweet potato for the potato, spring onion for the asparagus and so on. Initially, I had rosemary stalks for the tail, but it ended up looking too much like a peacock that way. 1. Bake the potato. This will be the body of the bird. 2. Once it is cool enough to handle, cut a slit in the front and scoop out a little hole. This will be for inserting the asparagus stalk as the neck. 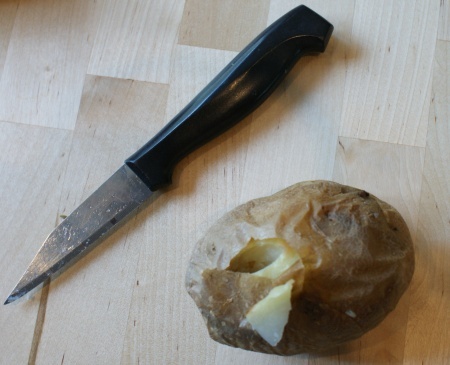 Cut slits across the back of the potato for the tail. Cut the asparagus down to about 2-3 inches for the neck. 3. 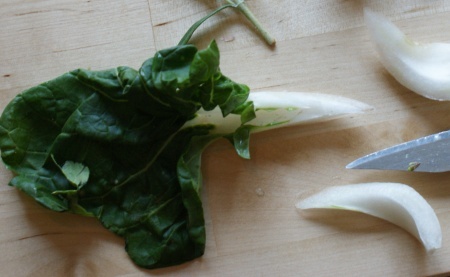 Prepare the bok choy leaves by cutting the stalks into points. Insert them into the slits at the back of the potato. 4. Prepare the radish by scooping out a hole for the neck and little holes for the eyes. Push the peppercorns into the eye holes. I found that the hardest part of making this turkey was getting the neck hole just right for the neck. Cut small holes for the eyes. Cut one larger hole for the neck. 5. Insert the asparagus into the neck hole in the potato. Add the radish on top and enjoy your handiwork. If you find that the peppercorns are stubbornly refusing to stay in place, then a dab of mayonnaise or sour cream will work wonders as glue. I used mayonnaise to put a leaf of rosemary on the beak for the photo. In person, so to speak, you could see the tip of the radish just fine for the turkey’s beak. This design is extremely healthy (since it is just an apple) and it looks very modern so if you have one of those modern-style box houses then this might be the proper table decoration for your holiday party. 1. Choose a nicely shaped apple and wash it. 2. Make a cut straight down from the top starting about 2/3 of the way down. This vertical cut should be about 1 1/2 inches long. Then make a horizontal cut just deep enough to meet the first one and be able to take the piece off. 3. Make another vertical cut 3/8 of an inch or so higher than the first one and a corresponding horizontal cut to take that piece off. Keep doing this until you have 4 or more pieces. 4. On the opposite side, make two shallow cuts to take out a wide pie-shaped slice and repeat that to make 4 or more slices. 5. To finish it, make cuts on both sides of the smallest slice to hint at eyes and a beak. Then slide the slices on both sides upwards, each the same small distance apart. Turn the smallest slice upside down. 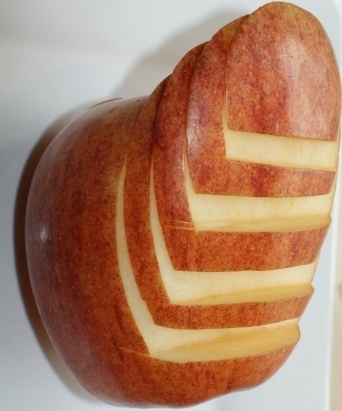 The moisture from the apple should hold it all together. 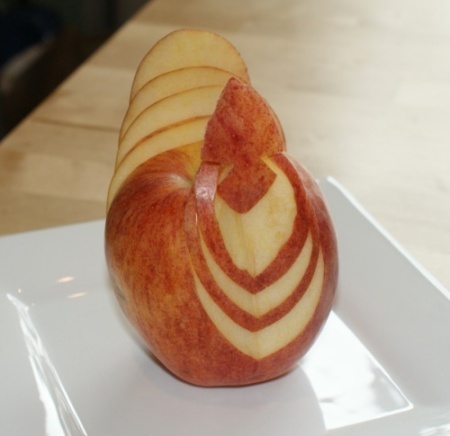 The apple turkey is easy to do, but needs to be eaten before it starts to discolor. Some varieties of apples take longer to discolor. This one was a Honeycrisp. You can get very creative with nuts – this one is fun and funny. 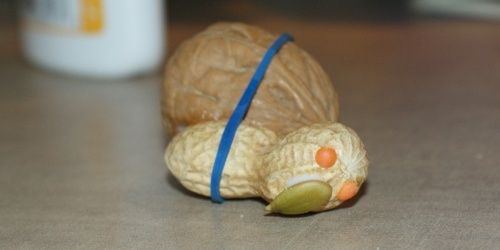 All it takes is a walnut, a peanut in the shell, a couple of lentils, 5 pumpkins seeds and some glue. 1. 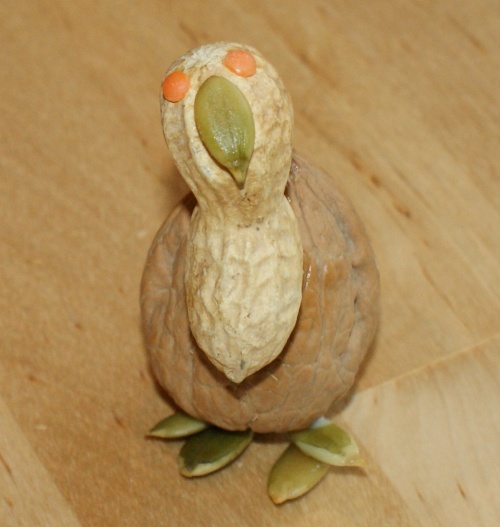 Glue the two lentils to the peanut as eyes and one of the pumpkin seeds on as a beak. 2. Glue the peanut to the walnut. I had to put an elastic around this to make it stay in place while the glue dried. 3. Glue two pumpkin seeds together for feet. Once the glue has dried glue the feet to the bottom of the bird. 4. Laugh at the result. I think the peanut turkey looks nicest, but the apple turkey looks tastiest. Have to say I like the peanut turkey. :) Very creative stuff here…. reminds me of a gourmet vegetarian restaurant I went to once where they charged $15 for a tiny sprig of lettuce with some pate on top of it:) hopefully your vegetarian guests don’t think they’re getting the short end of the culinary stick:) – time to beef up some of those turkeys! I think Mr. Pillars should give MRS.PILLARS the keys to this blog more often! Those are absolutely beautiful, but next time I try this I’m calling a professional. I cut my dang finger trying to make a turkey out of a potato, and I had to use duct tape to get the pumpkin seed beak to stick to the peanut for the nutty turkey. Other than that I think the projects were a great success. Mr C – it occurred to me too late that I should have identified myself. Mike can be quite domestic but it doesn’t run to funny food. ME & FP- That peanut turkey made me laugh too and still does. I put that one near the laptop for daily inspiration. Len – lol – thanks. Just LOVE the nutty turkey! I’m sure it will be a big hit! Peter & FB – The nutty turkey started out looking more like a camel in shades, which also made us laugh, but just wasn’t a turkey. I like your peanut Turkey. Your idea is just great. These are really cute ideas. This year I might actually try to be creative with my Thanksgiving food. The peanut turkey is my favorite! !